While flipping through the December 1938 issue of Photoplay I have I was really taken with this ad. Wouldn’t it be the perfect holiday dress? 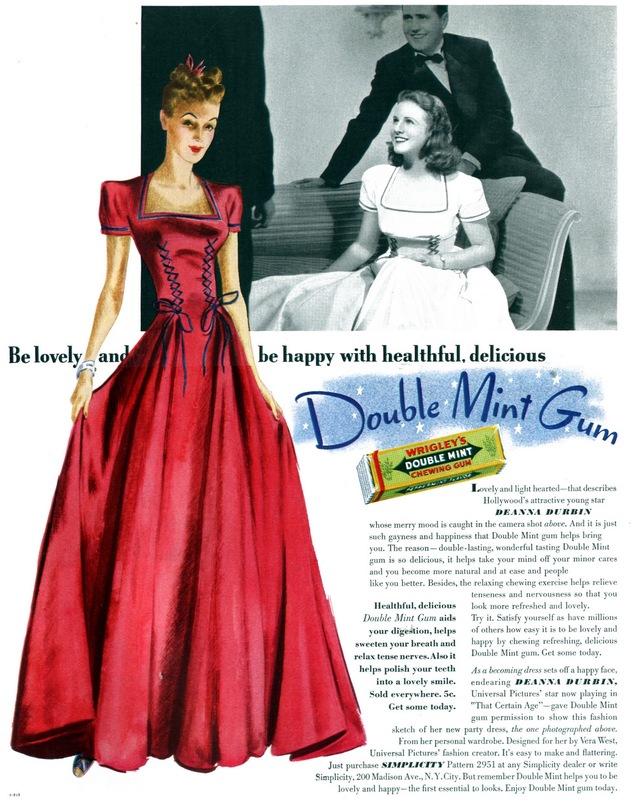 This is the second ad of this kind that I have seen in my magazine stash in which Double Mint Gum paired with Simplicity Patterns and a famous star of the day. The star in this ad is the beautiful Deanna Durbin, a personal favorite of mine. The pattern advertised is Simplicity 2951. Do any of you have it, dear readers? I would love to compare the pattern envelope to the ad! This ad claims the gown was designed by Vera West, a costume designer in Hollywood who was mostly known for monster flicks, ironically (read this interesting, if sad, article for more on Vera West). But I have to wonder- did the design team at Simplicity catch wind of the dress and make a copy? Or did Miss West actually design the gown herself for both Deanna Durbin and the pattern company? I’ll leave you to decide. >Wow! What a great dress! >Love it and my favorite Deanna! >What a sad life Miss West had. I love the costuming from those early Universal horror movies. On a brighter note just minutes before reading your post I discovered Deanna Durbin is alive and well living in Paris. That is a fabulous dress ! >Great dress! The lacing detailing is such a fun addition.